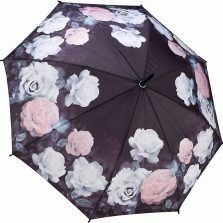 Here we have our Butterfly Mountain stick umbrella, another beautiful umbrella from Umbrella Heaven, with detailing second to none. 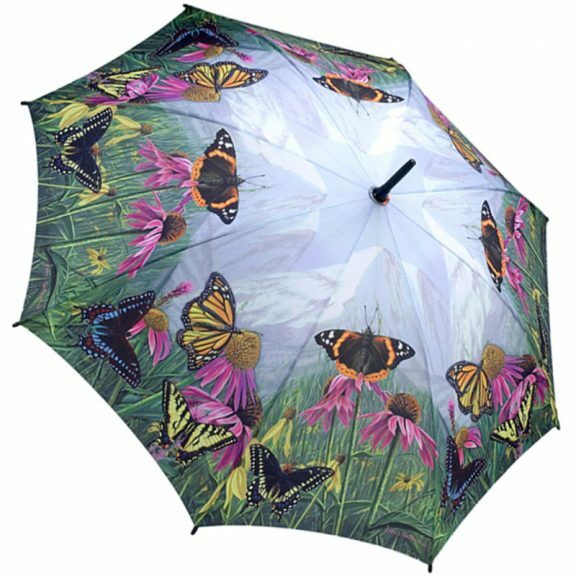 A beautiful butterfly umbrella, an art umbrella with butterfly design by James Hautman. 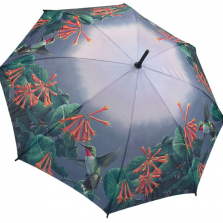 Honestly, this butterfly mountain stick umbrella is something else. Features virtually unbreakable fibreglass ribs on a steel frame. Matching black shaft, crook handle, spoke tips & top. 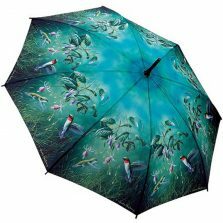 This sensational butterflies design umbrella features an automatic opening mechanism. Also, an overall length of 89 cm / 35″ and a huge canopy span of 100 cm / 39.5″ when open. 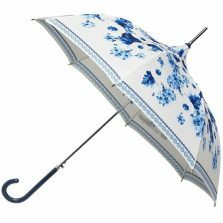 More than enough for 2, these umbrellas really are something special. Stunning artwork by James Hautman. The Hautman Brothers James, Robert and Joseph (Jim, Bob & Joe) have established themselves as America’s foremost family of wildlife artists. All three brothers have received numerous honours and awards. In 2010 Jim became only the second artist to win the prestigious Federal Duck Stamp Contest four times. Jim Hautman’s work has been displayed in a variety of places. Examples include; the Oval Office of the White House, the Smithsonian Institution, the Leigh Yawkey Woodson Museum. Further featured in public and private collections throughout the world. Click to find out more about the Hautman Brothers and their work.